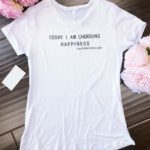 “TODAY I AM CHOOSING HAPPINESS…” – Spread a positive message instantly with this amazingly soft and comfortable T-Shirt. 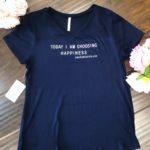 Great for every day as well as for active lifestyles. 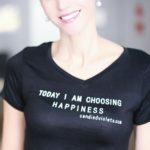 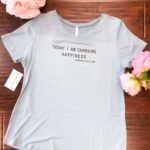 This T-Shirt is regular sized and features a small V-neck with the phrase “Today I am choosing Happiness…” printed on the bodice.